lights out espn youtube YouTube Red Walt Disney Co. If you’ve decided to pony up the $9.99 monthly fee for YouTube’s new paid subscription service, your money won’t be buying you access to basically any ESPN videos. The sports network — owned by Walt Disney Co. (80%) and Hearst (20%) — failed to negotiate a deal to have its videos available through YouTube Red. 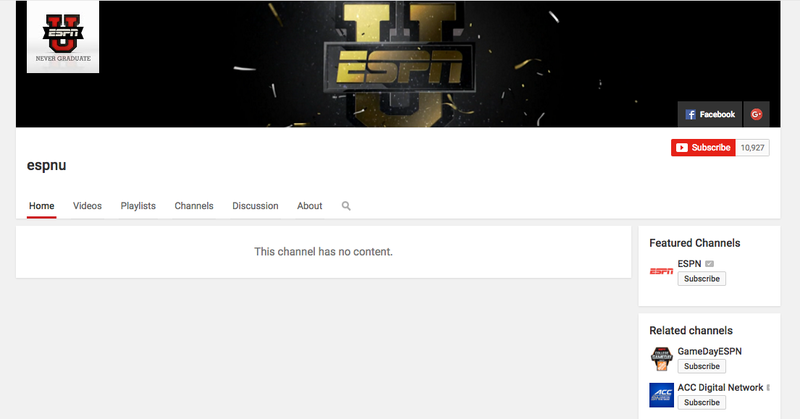 As a result, most of ESPN’s featured YouTube channels have gone dark. Out of ESPN’s 13 featured channels — including Grantland, SportsNation, ESPNU and others — only two still have videos, notes Mashable: X Games and NacionESPN. Some channels simply have messages reading, “This channel has no content,” while over on the main ESPN channel, the most recent videos are from three years ago. Any companies making money with videos on YouTube had to strike deals for rights to show them on the new Red subscription service. If they don’t agree to YouTube’s terms, videos are hidden inside the U.S. from all of YouTube, even the free version. YouTube told Gizmodo in a statement that most companies had made deals to avoid this. ESPN declined to comment to Mashable, and YouTube did not immediately respond to a request for comment. ESPN likely had a tougher time than others in this area, as a lot of its content involves layers of rights, a source close to the situation explained to Mashable. That insider said that sports videos such as those published by ESPN tend to involve many third-party rights that are affected if that work is suddenly not being distributed for free.